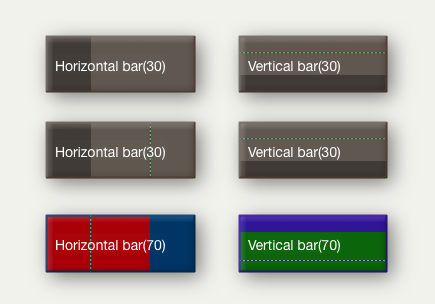 Notes and containers in map view can make use of patterns that simulate horizontal (bar) or vertical (vbar) progress bars. As the patterns can use evaluated arguments as well as fixed numerical values this form of mark-up allows the progress of tasks to be monitored and displayed in the background. Containers (including agents) can use progress bars too though the progress bar is drawn across both title bar and icon, not just the title bar. Use of progress bars is not compatible with use of container plots as both features use the Pattern attribute to store their value. This progress bar can also be displayed in outline view using swatches. Progress Bars now accept an optional fourth argument, a target value, casing a thin line to be drawn at the target position.